You don't need "big bucks" to have a great looking engine compartment! The Speedboxx covers the "ugly" - and leaves a clean, high tech space in its place! Forget all the expensive chrome, the Speedboxx comes in carefree polished stainless steel or raw steel, ready for paint to match your favorite ride. Over two hundred louvers add style and improve airflow. 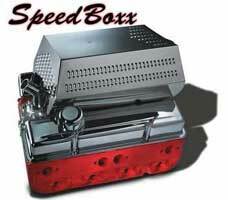 The Speedboxx includes air filter, adapter and necessary hardware. Improve your atmosphere - and your attitude - with the Speedboxx! (Ed has owned this car for 46 years!